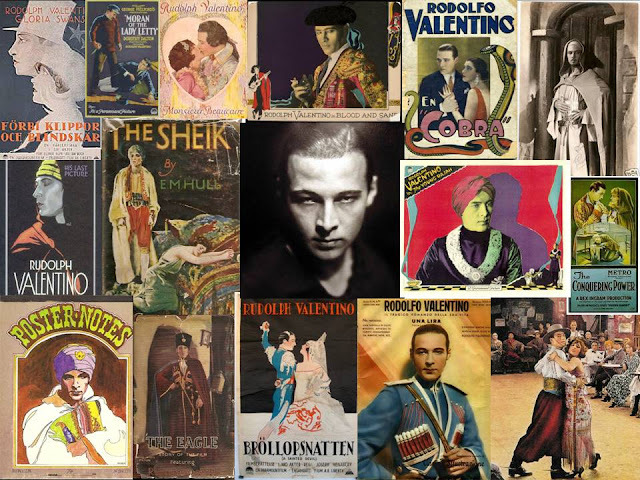 A visual and informative reference guide to Rudolph Valentino collectible items. Sometimes the Valentino Items find you!! Hello all, please forgive me for my absence. I just spoke with my fellow Valentino collector friend, Jim Craig you asked where I have been. He told me it had been almost a year since I have posted. Which is ridiculous! I am still very much a collector and fan. I have been so busy with work, a small business and family! Anyway, I have a great Valentino Collectible story to share with you. About 5 years ago I purchased a cut signature on ebay. The wording of the listing was a bit confusing and I assume the seller was unaware of what they had. Long story short, I purchased the signature for about $100. I was ecstatic and could not wait to get my new autograph in the mail. I was hesitant and wanted to examine it up close! After a week or two I grew impatient and was curious where my autograph was. I contacted the seller who told me it shipped and provided me tracking information. The tracking stated my package had been delivered! I contacted the post office....nothing, checked with neighbors....nothing. I was so upset that my autograph was no where to be found. Fast forward a few weeks ago. I went out to our subdivision garage sale. I walked across the street about 4 houses down, went into their garage, looked down.....and there it was! My cut Valentino signature with a sticker that read $10. I literally picked it up, held it in my hand and began laughing. The man, who's house I was at, looked at me funny. I looked at him and said, "you are not going to believe this; but this is mine." I went on to tell him the entire story. He seemed "busted" to say the least that he had received my mail and not returned it to me. He quickly said, well, uh, I got that in the mail, I did not know what it was and simply threw it aside. I said look, I will pay your $10; but this is mine. He quickly said, no, no, I feel terrible. Take it, it's yours. He then asked me why would I buy this in the first place. I said because I was a Valentino collector. He obviously had no idea what he had. He proceeded to show me a few baseball cards he had for sale which he bragged were worth $10-$20, which he had looked up online. 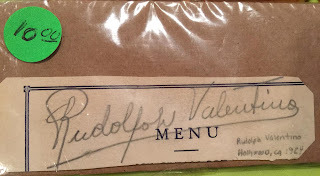 How fortuitous for me that he failed to type in Rudolph Valentino autograph! With my autograph tightly in hand I quickly left his home, walked 5 houses up and brought home my "find" 5 years later! I was more shocked than upset that I actually got back my autograph! Unbelievable! Anyway, it was the best day I have ever had at a garage sale! 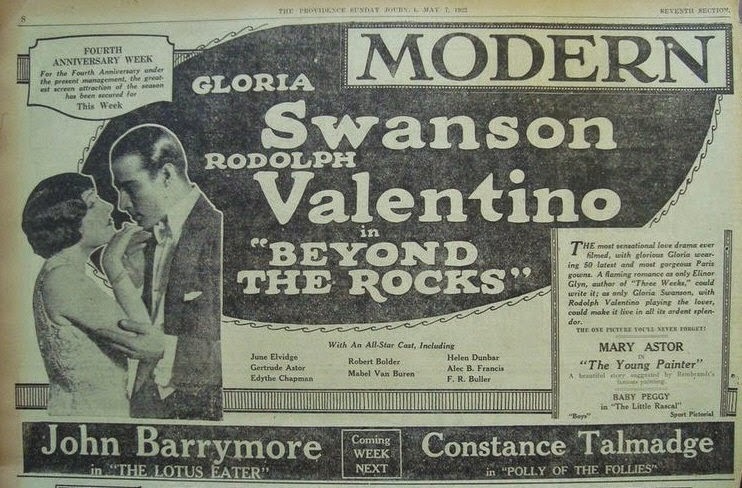 This is a Movie Flyer / Advertisement from the film, Beyond the Rocks with Gloria Swanson. I find this to be interesting because when I translated this flyer, which reads: le droit d'aimer, in English means: The Right to Love. I am not sure if they released the film with this title in France or not. It is very interesting. This a wonderful overseas piece, this would look great framed.....on my wall. This is a rare, vintage Valentino book from Italy. The front of the book reads, Great Artists of Cinema, Rodolfo Valentino. I am not sure of the age, my best guess would be post Valentino's death. It appears to be yet another thing to sell with his image on the front, as so many magazines did the same. I am an avid Valentino book collector; so, of course this is one I still have to have. Another item to squeeze into the Rudy room! 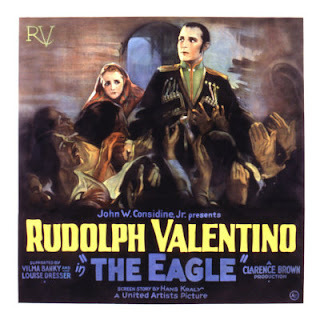 The is a great variation of a movie poster from the 1925 film, The Eagle. This appears to possibly be a half sheet. This film had many fantastic variations of movie art depicted on posters. This was Valentino's 3rd to last film. He starred as Vladimir Dubrovsky, a Russian solider. I feel it is one of Valentino's finer films. I do not think this film gets the credit it deserves amongst Valentino's work. The film had action, great acting, and a solid storyline. Valentino's acting performance, I feel, is amongst his best. This poster is a fantastic piece, it is a fairly rare variation. Would love to own this one myself. Ok, last Birthday post. I typically post 5 photos at a time. However, there are some photos that simply stand alone. This is one of those photos. 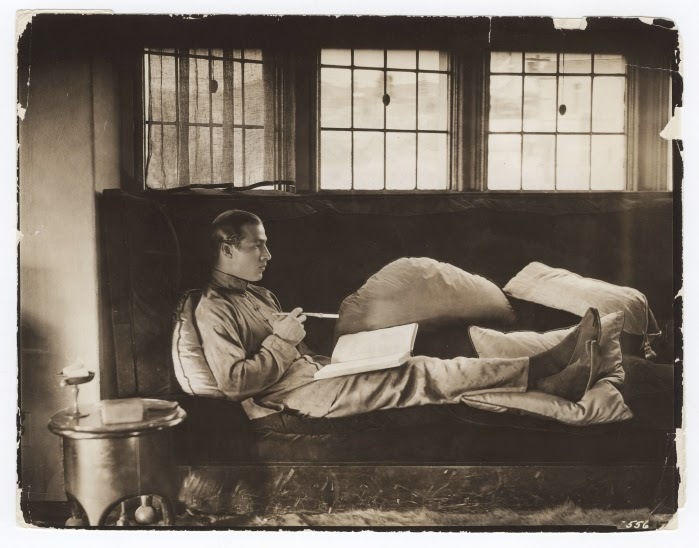 This is a fantastic photo of Valentino with laying on his couch with a book and a cigarette in a cigarette holder. A staged candid photo if you will. A absolute fantastic photo of Valentino! I hope all of you enjoyed Valentino's 120th Birthday today. I have yet to purchase any Valentino items or watch a Valentino movie; however, I still have a few hours before bed. This post features a color Henry Waxman photo. It appears to be colorized and almost looks to be an art print of some type. Unfortunately, I do not own this item, this is just one of the thousands of images I saved from the internet over the years. A classic Valentino stare! Enjoy the rest of Rudy's Birthday! 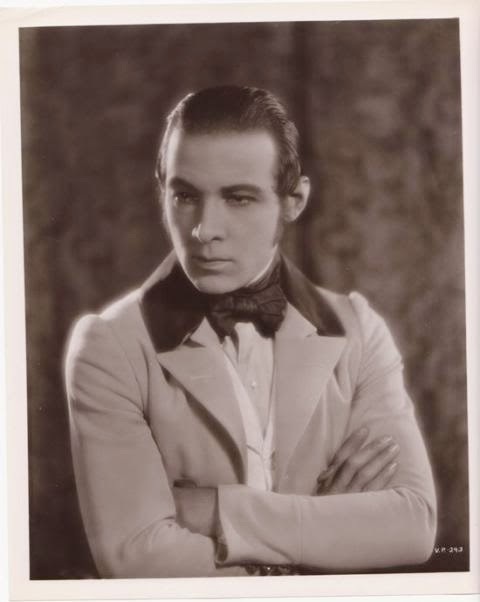 Happy 120th Birthday Rudolph Valentino! Happy 120th Birthday (about 1.5 hours early) to Valentino! I hope all is well with all of the collectors, fans, and vintage Hollywood fans. So, today Valentino would have been 120 years old. Take time out today to buy a Valentino item, watch a Valentino film, or simply tell someone what today is. 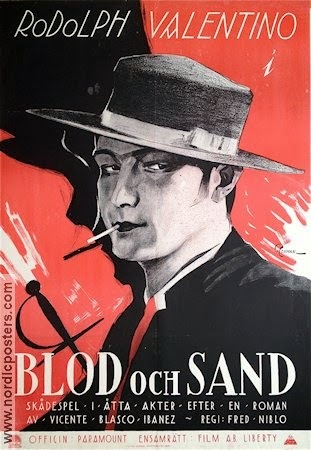 I am posting an awesome Swedish Movie Poster from Blood and Sand. The poster is simply awesome, not much else to say about it except it would look wonderful framed and hanging up in my Rudy room, haha. Enjoy the day, long live Valentino! 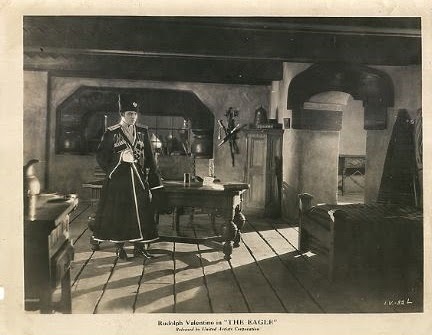 These are five photos from the 1925 film, The Eagle. Even though this was a period film, it had a very modern feel to it. For me, it seemed to showcase what moviegoers had to look forward to with the upcoming talkies. 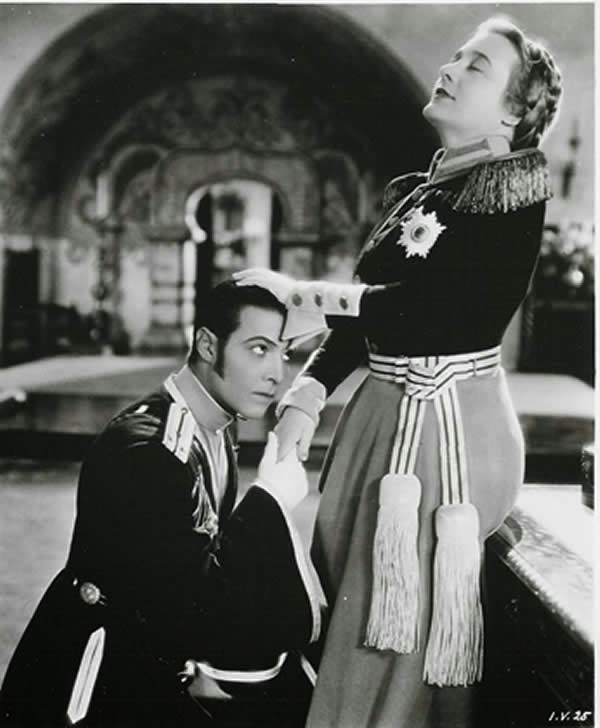 It seemed to be a film showcased on a grand scale, with Valentino carrying the film with a great cast including Vilma Banky, Louise Dresser, and Albert Conti. 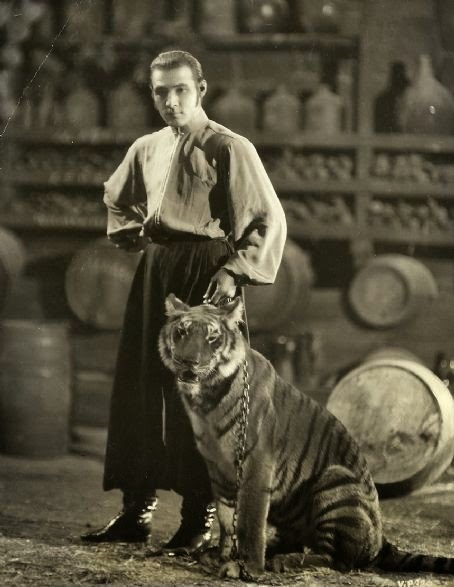 This would have been the type of film I could have imagined Valentino starring in as a talkie. One where he, as the lead, would have to pull off an accent. This was released just 9 months before his death and 11 months before The Jazz Singer. I still feel Valentino would have made it in the talkies. I often think about a comparison from this to Elvis making it in the 80's. Even though Elvis was older, I find it interesting to think about and compare the two. The 80's, introduced MTV in the music world, imagine Elvis making videos for MTV. Anyway, I digress, I am a big fan of both and think they would have made it in the next step of technology/advancements in their fields. This is a Danish Movie Herald from Monsieur Beaucaire from 1924. This is a wonderful colorized photo of Valentino from the film. 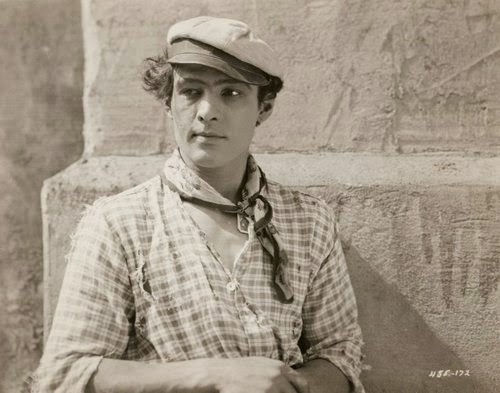 Once again, the overseas variation offers a wonderful, unique color photo of Valentino from the film. You do not often see many of these overseas heralds, they are fairly rare and desirable, if not for the rarity, for the unique covers. This is a rare and fairly difficult book to find, especially with the dust cover. This is "The Real Valentino," by George S. Ullman from 1927. I posted this book a long time ago; however, that post did not have a photo of the dust cover, this one does. I went to post this book, did a Google search to find an image and found one for sale with the dust cover. So, now of course that book is on it's way to me. Another one for the collection! 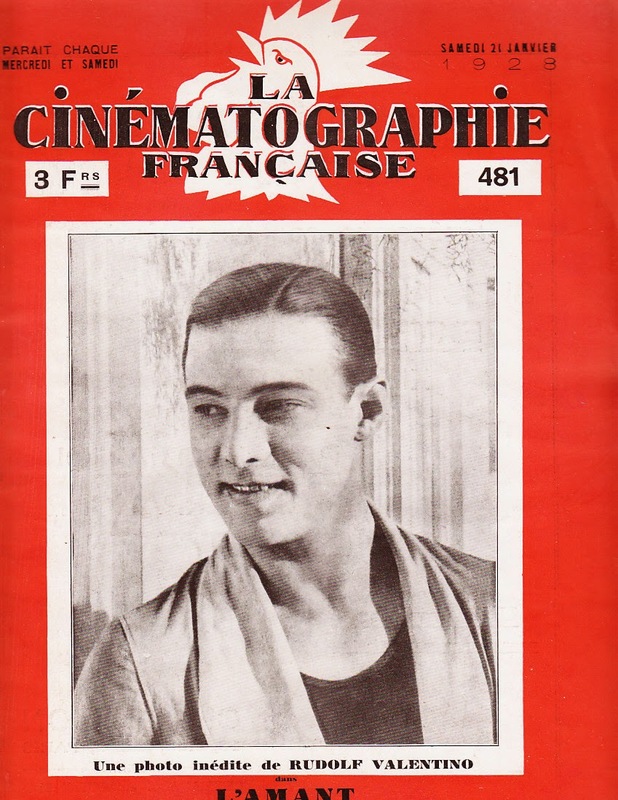 This is a magazine from France, called La Cinematographie Francaise, or French Cinematography. The magazine is dated 1928, which I find interesting. Two years after his death, there were no movies to promote, or anything to sell, except magazines. Two years after his death fans were still buying magazines with his image on the cover. This particular magazine is not seen too often, nor is the photo of Valentino that was used either. A very interesting piece. This is another great example of a newspaper ad from May of 1922. Surprisingly, many of these ads are still around today, there are literally thousands of variations of these movie ads for Valentino's movies. This one depicts Valentino with Gloria Swanson, another great piece. This is an awesome photo from 1921. 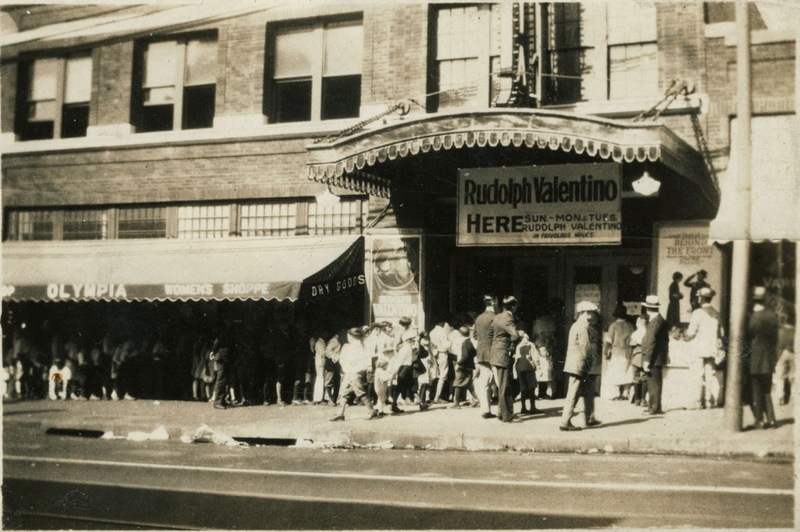 The photo depicts the outside of a movie theater with the marquee/sign that reads Rudolph Valentino Here Sun, Mon, Tues, Rudolph Valentino in Frivolous Wives. There appears to be a fairly large crowd, mainly younger people lined up to get in the theater. The sign almost makes it seem like he is going to make a personal appearance, which he may have. Most likely, it was a great way to get fans attention, you know since there was no Twitter, Facebook, Blogs, Cell Phones, Etc. The other interesting thing is "Frivolous Wives." 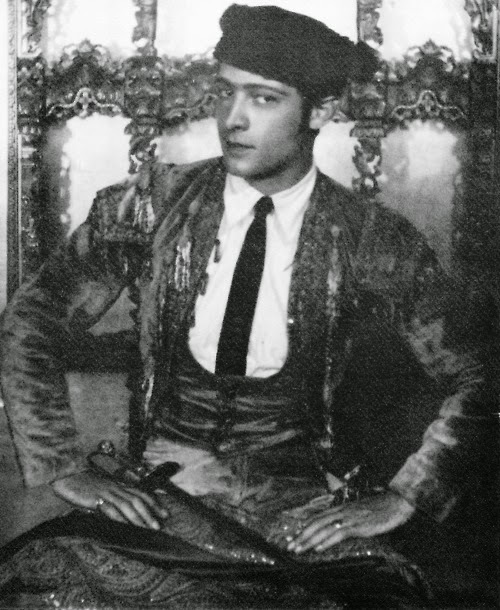 In 1918 Valentino had a smaller/supporting role in a film called The Married Virgin. 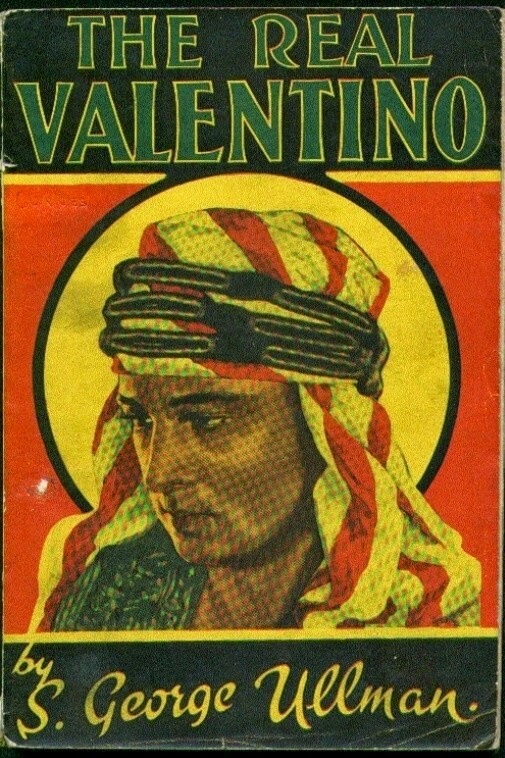 When Valentino's fame grew from The Four Horsemen and The Sheik, studios and directors cashed in on his fame by re-releasing some of his earlier films. In this case the director Joe Maxwell edited the film down from 7 reels to 6. This new 6 reel film which seem to showcase and sometimes repeat scenes with Valentino. The film was re-released in 1921 under the name Frivolous Wives, making it seem like a new film. This photos simply depicts the fans lining up to see the film. A great early snapshot of filmgoers and the movie theater. I still love to simply scour the internet for photos of Valentino. I spent a lot of time doing just that when I first started collecting....well a couple of years ago....or something like that, I don't exactly remember. Anyway, I would find photos and print them, going through a lot of ink at the time. I know I have said it a million times, but is simply amazes me that I can still come across not only collectible items; but, photos I had never seen before. 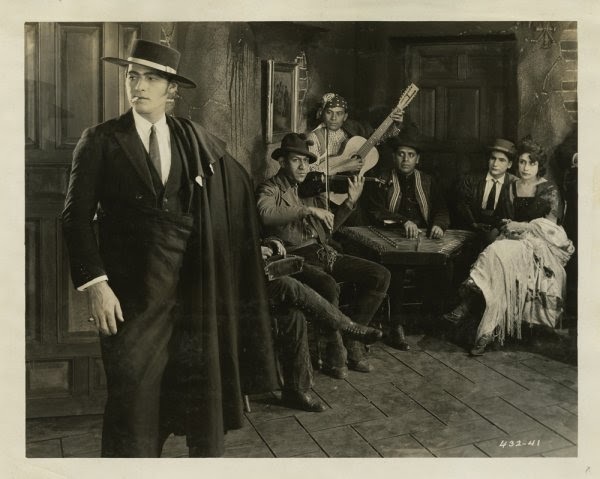 The following are 5 photos from the 1922 film, Blood and Sand, one of Valentino's finest. Some of these poses are not often seen, enjoy! This is a wonderful magazine out of the UK called Picturegoer. 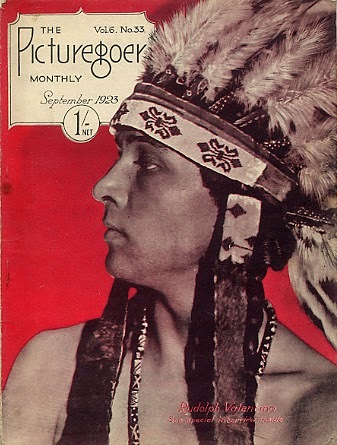 The magazine is dated September 1923. 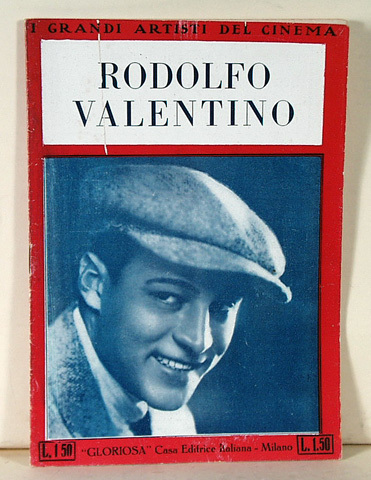 The cover depicts Valentino as his personal spirit guide, Black Feather. It is not common to see Valentino on the cover of a magazine not depicted from a film or a movie studio photo. This makes this magazine a very unique item. 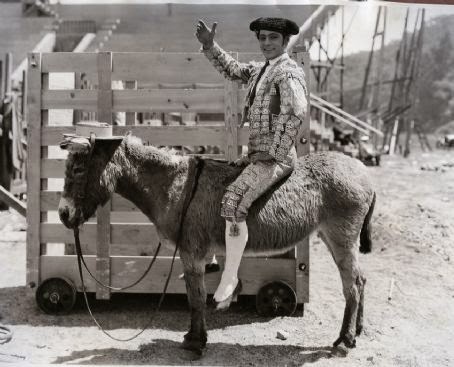 I'm sure many fans at the time did not get this photo or was maybe confused that Valentino was going to be an American Indian in an upcoming film. You have to remember that this was when Valentino was having contract problems with Famous Players-Lasky, it was also when he published Daydreams. So, at the time he was selling himself instead of a specific film at the time. This is a great magazine, still looking for this one myself. I hope everyone had a great Holiday. This one here was the highlight of my Christmas gifts. This is an extremely rare Russian Valentino Paperback Booklet. I honestly know very little about it, and unfortunately am unable to read it. I do know this is extremely rare, I had never seen this book prior to getting it for Christmas. It is awesome to still be able to come across items I've never seen before. This is a wonderful example of an early Autographed photo of Valentino. This photo is signed R. Valentino, which is not too common to find. It is also signed in Valentino's favorite color ink to sign autographs, green. This is a wonderful example of an early signed photo. I would love to have a piece like this. These early signed photos are getting harder and harder to find. This is another great example of an original newspaper ad from the 1922 classic, Blood and Sand. As with most of these ads, it depicts slightly different art from most of the posters, lobby cards and various promotional material. As I've said before, these are great to collect. They are easy to frame or put in a scrapbook and they are reasonably priced. Finally, I like this ad because it actually depicts Lila Lee and Nita Naldi together. Most ads only depict one. Just as I am amazed when I find some new photo I have never seen. I am also pleasantly surprised when I see posters or lobby cards I have never come across before. This is a rare card from Beyond the Rocks. Until now, I had never seen this card. This would really look good framed in my Rudy room! 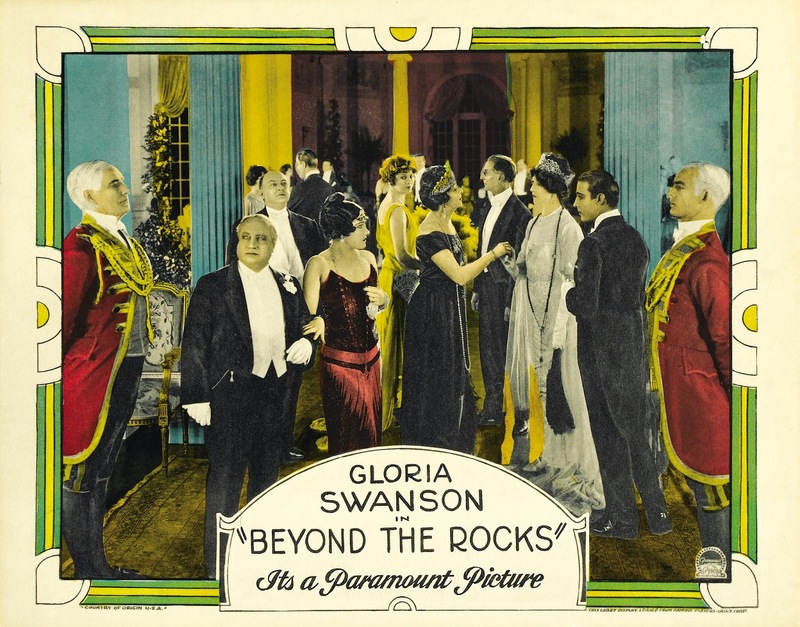 This is a tobacco card from the 1922 film, Beyond the Rocks. I am not sure of the manufacturer. 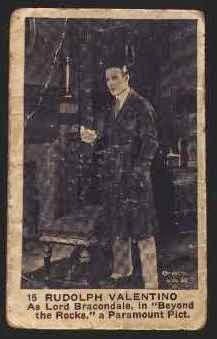 There were countless tobacco cards produced depicting Valentino along with various movie stars of the day. This is one you do not see too often. 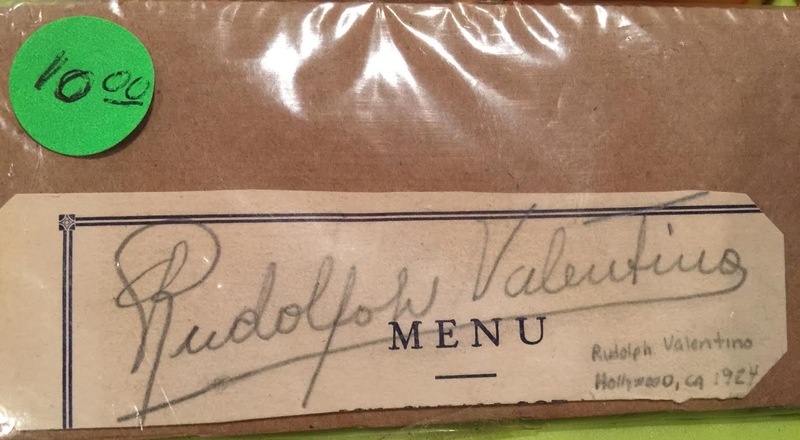 This blog is a visual guide of Rudolph Valentino collectible items. Have any unique Valentino items? Please send me your scans, photos, and links to your Valentino items so I can post them on the blog for everyone to see. Please include as much information as possible about the item. If you send photos to post I will credit you for the photo unless you would like to remain anonymous. Send as many photos as you like, I will post them as soon as I can. Thank you and enjoy the blog! 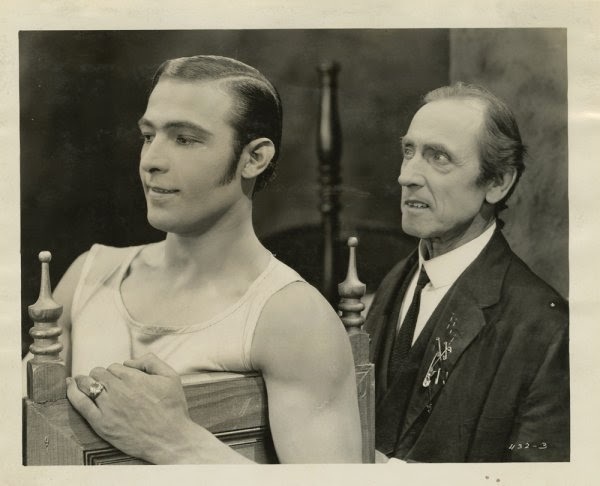 My name is Brad Frick, I have been a Rudolph Valentino fan / collector for the past 20 years. I wanted to create a site where collectors, fans, and movie buffs could view photos of the thousands of Valentino items from the past 90 years or so. I hope you enjoy the site, feel free to contact me or comment on any of the items posted with your thoughts or if you have any other information. Thanks for visiting the site, enjoy!